Who doesn't love a bit of Greek Mythology? Andromeda was the daughter of the King of the North African kingdom of Aethiopia and her mother Cassiopeia was quite a vain little thing. In a fit of arrogance Cassiopeia boasted that her daughter Andromeda was more beautiful than Juno and all the sea nymphs. This pissed off Poseidon so much that he sent a sea monster called Cetus to ravage the Aethiopia coast as revenge. This caused the region a lot of heartache and in the end the desperate King consulted the Oracle of Apollo who told him that nothing could be done until the King appeased Poseidon by sacrificing his daughter to the monster. 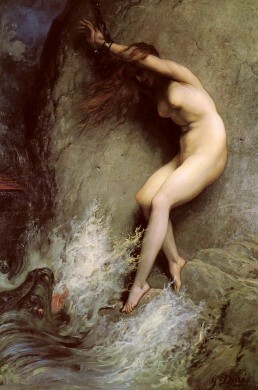 So the King & Queen stripped Andromeda naked and chained her up to a rock on the coast to await the sea beast. As it happened Perseus (the hero who had just come from beheading Medusa) happened to pass by Andromeda chained to the rock and killed the sea monster before it could hurt Andromeda. He set Andromeda free and later married her. 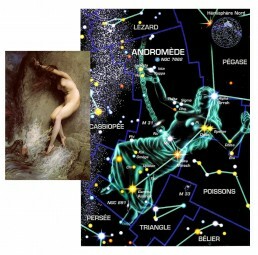 When Andromeda died she was placed among the constellations in the northern sky – she is represented as a figure of a woman with her arms outstretched and chained at the wrists. Gustav Doré was a prolific artist and is probably best remembered for his illustration work for books such as Danté’s Divine Comedy. He produced over 100,000 sketches in his lifetime which averaged out to be about 6 sketches per day for every day he lived. He was self-taught and reportedly never used live models. He lived with his mother his whole life and when she passed away, its said he lost the will to live and died at the early age of 50. He painted this beautiful picture in 1869.